In the Web 2.0 era I don’t really use a lot of desktop applications anymore - everything is on the web, right? But there is one application that I just can’t imagine living without (even though you can also use it on the web): Evernote. I love the fact that I always have access to Evernote, regardless of which computer or mobile device I’m using. And with the desktop version, I don’t even have to be online to work with Evernote (very useful on train trips!). Most of the time, I use the Mac OS X desktop version, but I sometimes check notes on my Android phone or iPod Touch. And yes, there’s also a Windows version, a web version and custom applications for major smartphone platforms (see the list of available downloads). Oh, did I mention it’s free? You don’t have to pay for basic use or any of the apps. But in case you need more space or want awesome features like Note history, you can go Premium for $5/month or $45/year. I’m still using the Free version, which has plenty of space for all my text notes, but I’m thinking of going Premium just because I find the service so useful. With Evernote I finally have a single place to store all my ideas and little notes. No more sticky notes all over the desk, no more .txt files on the desktop, just one app. And I also find it great for transforming ideas I collect into drafts that I can move to blogs, text editing software etc. for final design and publishing. And yes, I also wrote the draft for this post in Evernote and only moved it to Blogger when it was nearly finished. I really prefer to write in the simple, clutter free Evernote window - I usually double click the note I’m working on and leave just that note window open. I always use Evernote to take notes on my laptop during meetings. No more wasted paper and illegible hand written notes! And if you still need to draw something on paper or whiteboard, you can just take a picture of that and add it to your Evernote meeting note. The best part is getting home after meetings to find the latest notes already waiting for me on my desktop computer. In other words, no extra time needed to sort and read through notes, as I can start working right within Evernote. 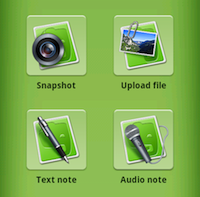 The cool part is that Evernote is not just a simple backup service for notes. In fact, the Evernote elephants in the cloud also do image recognition on any photos you add, so that it’s easier for you to find your stuff. You can for instance use Evernote to scan and save images of business cards and Evernote makes sure all the text becomes searchable. There are many different ways to sort notes in Evernote. I like to create new notebooks for major projects or areas of interests, and you can use tags to sort your notes even further. I must admit I’m pretty sloppy when it comes to using tags, but that’s ok - Evernote doesn’t mind that, and helps me find what I’m looking for through Search. 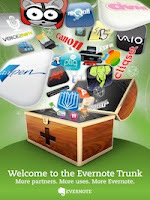 And if you’re looking for ways to improve Evernote, look no further than into the Evernote Trunk! The Trunk, also accessible from the desktop applications, is basically a showcase of apps that work with Evernote and can enhance your Evernote experience. The Trunk has only been launched this summer, so I’m really looking forward to seeing more apps added in the future. The only two feature requests I have for Evernote are better sharing/collaboration options within the desktop app and color coding for notes. But other than that, I really think Evernote is a great product that is simple, yet incredibly flexible and usable in all sorts of situations. 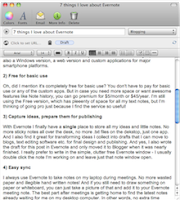 So, if you’re not using Evernote yet, I suggest you give it a try and see how it works for you. Keep in mind that there is no right or wrong way to use it - be creative and start adding your ideas in any format into your digital notebooks. 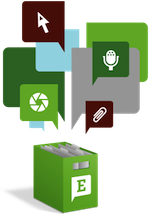 And if you’re looking for new ideas on how to use Evernote, check out the Tips and Stories section on the Evernote blog. If you’ve got any good Evernote tips, let me know in the comments!